Her vision worsened to the point she could no longer even see shadows. Her visual acuity (or lack thereof) would easily qualify as “legal blindness” to eye professionals. With just a few miles to go, Courtney used her husband as a makeshift blind guide: He verbally instructed her where to turn, lift her feet, and more. Incredibly, she ended up winning the female race, and her experience was brilliantly documented on Ultra Runner Podcast. Little did she know that, on that very same day, Mark Hammond in the men’s race had begun to lose his vision at mile 70. Back in 2013, I flew to California from Denmark to begin navigating the uncharted territory of vision loss among ultramarathon runners with Dr. Marty Hoffman. He had, much to his surprise, noted in a survey study (Hoffman, 2011), that vision problems developed in 2.1% of 100-mile finishers and in 3.6% of non-finishers. I ran this by all the ophthalmologists in my department in Næstved, Denmark, one morning and they were both baffled and interested. One of the doctors suggested that the vision loss may be due to hypoglycemia, or blood sugar that’s too low. I doubted this, being a seasoned ultrarunner myself. After all, unless you take insulin, a runner’s (or anyone else’s) blood sugar should never go so low as to induce sustained vision loss. But honestly, I could not even wager a guess. 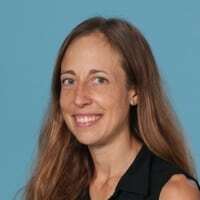 Marty Hoffman, Kim Corrigan, and I were able to, in a matter of just a couple months, recruit 173 people from the United States and abroad with a self-reported history of “significant visual difficulties” during an ultramarathon (Høeg, 2015). We had posted advertisements on websites and listservs and never expected to be able to study so many runners. As I read through the survey results, it became quickly apparent that nearly every single one of these runners had experienced the same constellation of symptoms, and many of them over and over again. What exactly did they experience? Painless clouding of their vision that would get progressively worse and not go away until they stopped running. At this point, most humanoids would have the following internal monologue: Running seems to be causing me to go blind. Maybe I should stop. But not ultramarathon runners. They keep running. This is what makes them (us) such an interesting breed to study. And study we did, because we still did not know what was happening to the eyes. 2/10 had a diagnosis of “contact lens irritation.” This is expected to be painful and resolves with removal of contact lenses. While contact-lens irritation should be considered in runners with vision loss wearing contact lenses, we do not consider contact-lens irritation to be the classic form of ultra-related visual impairment. *One participant in our study reported visual issues for six to eight months following his race; however, it was not clear if the vision loss was related to the race or was indeed a case of UAVI. This participant was lost to follow-up preventing further investigation of the case. Our study suggested that UAVI is most often a self-limited, painless clouding of the vision due to corneal edema. What Is the Cornea and What Is Corneal Edema? 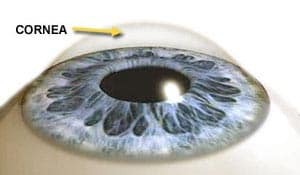 The cornea is the protective, clear, dome-shaped layer of tissue that covers the front of the eye, in front of the pupil and the lens. In corneal edema, the cornea becomes excessively filled with fluid and loses its transparency. UAVI-like corneal edema is also known to occur in long-distance cycling events. Below is a picture of a participant in the Leadville Trail 100-Mile Mountain Bike Race. Corneal edema is apparent in his left eye. 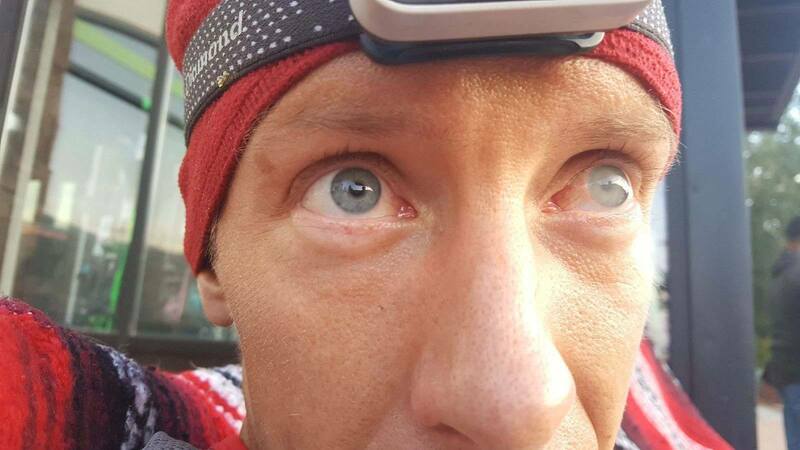 While I was writing this article, my friend and fellow ultramarathon physician researcher, Dr. Michael Campian, told me he had seen a photo of Mark Hammond’s eye from this year’s Run Rabbit Run 100 Mile. Mark was very kind to give me permission to use his photo and name for this article. Why Is Corneal Edema Happening at Endurance Events? One theory is that stress to the cornea (hypoxia/altitude, cold, dehydration, debris, wind, etc.) can lead to a buildup of corneal lactate, which can act as an osmolyte in the cornea (the reverse of what happens to a cucumber when you turn it into a pickle), drawing more fluid in. The corneal acidosis from lactate buildup may further contribute to the swelling by inhibiting the cornea’s tiny pumps that push fluid out and keep our vision clear. In addition, there may be inadequate frequency of blinking. This idea came up because the blink reflex is known to be altered after refractive surgery and refractive surgery is a major risk factor for developing UAVI. Refractive surgery: Ultrarunners with a history of UAVI are approximately twice as likely to have had refractive surgery (such as LASIK) on their corneas than a reference group of “standard” 100-mile race registrants (p=0.001). Participants with refractive surgery were also more likely to have repeat episodes of UAVI (p=0.01). I just need to pause for a minute to acknowledge what a big finding this was. Ophthalmologists who perform refractive surgery are fond of saying this is a nearly risk-free procedure. However, if you like running ultras, this is a risk to be aware of. The reasons this procedure increases the risk of UAVI is not yet known, but may be because it disrupts the normal function and tissue of the cornea such that fluid can accumulate more easily. Alternately (as stated above), LASIK surgery has been found to interfere (by disrupting the nerves) with the normal blink reflex, thereby potentially predisposing to both corneal edema and frozen cornea (discussed later in this article). Long races: The mean (±SD) distance at which visual impairment began was 45 miles. The 100-mile distance was the most common race distance in which survey participants reported vision impairment, accounting for 46.8% of episodes. Significant wind was reported in only 23% of cases, so was far from the only cause. Also, if wind or debris were the only cause, contact lenses would be expected to prevent UAVI, but they don’t seem to. Altitude (>2000 meters) was reported in only 32% of cases and the most frequent altitude UAVI occurs at is at or around sea level. Participants with repeat episodes of UAVI have frequently mentioned having success with protective eyewear. 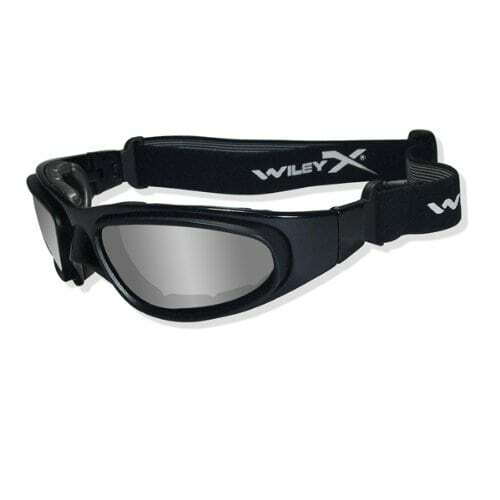 I was in contact with runner Mitch Chazan in writing this article, who had numerous episodes of UAVI before trying the Wiley X Sg-1 Matte Adjustable Strap Sunglasses. Since he started using these several years ago, he has not had another episode. A nice feature of these glasses is you can switch the lenses out for no tint at night. When we published our article (Høeg, 2015), it fascinated us that none of our participants had found an effective treatment for reversing the vision loss other than stopping running and giving the eyes a chance to rest. In writing this article, I reviewed the medical literature on treatment of corneal edema and ran across the interesting idea of 5% hypertonic saline eye drops. I discussed this with Dr. Miranda Bishara, an ophthalmologist affiliated with the University of Kansas with specialty training in cornea and refractive surgery, who stated: “ophthalmic hypertonic saline drops are used frequently to help decrease corneal edema… I don’t recommend patients use them more than four times [per] day.” She recommends racers use the drops rather than the ointment as they work more quickly and do not cause additional blurring of the vision. I have started recommending runners with frequent UAVI carry a small bottle of these drops during their races (or stash a couple bottles in drop bags) to use if vision loss develops, but have yet to receive any feedback on this idea. (Please let me know if you try the drops and how effective they are!) Also, race medical personnel may consider including a bottle in their medical kit, which would not only be a potentially effective treatment but also clinch the diagnosis of corneal edema if effective. 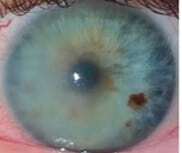 Corneal abrasion is frequently suspected, though this appears to be the incorrect diagnosis, in cases of classic UAVI. That is not to say that corneal abrasions don’t happen while running. The most important distinction is that corneal abrasions are painful, while corneal edema is not. Additionally, a corneal abrasion will not look white to anyone looking at the runner’s eye. Corneal abrasions will also have a specific defect on the surface (epithelium) of the cornea that can be readily seen under a black light with yellow (fluorescein) eye drops. Frozen cornea or the “Hellgate Eye” reported at the Hellgate 100k in Virginia appears to be an entirely different entity in which the cornea literally freezes in the cold. This is also known to occur in sled-dog races in Alaska. Soldiers, pilots, skiers, cyclists, ice skaters, and snowmobilers have all been reported to develop frozen cornea. This can be treated by warming the corneas, i.e. removing the cold exposure and closing the eyes. (Warming blankets and similar may also be used.) Shielding the eyes with form-fitting glasses/sunglasses or goggle-type glasses would also probably work to help prevent this by trapping body heat and keeping the corneas warmer. Corneal thickness increases at high altitude and may or may not be accompanied by vision loss/distortion. This is not believed to be an exercise-induced phenomenon, but increased corneal thickness at altitude may be a risk factor for UAVI. Pain or darkness in relation to vision loss is potentially dangerous and less likely to be corneal edema or classic UAVI. Other causes need to be suspected and ruled out with a prompt examination by an eye professional. Persistent tunnel vision and double vision have also been reported to me in relation to running (though outside of our study set) and runners who experience either of these should be examined by an eye professional. First, I want to offer a word of reassurance. Corneal edema, frozen cornea, and superficial cornea abrasions all occur in the corneal epithelium (the top/outermost layer). This is the one layer of the cornea that can easily and quickly regenerate. Because of this regeneration, these conditions (including UAVI) do not cause permanent visual damage. If this is your first episode, be sure that what you are dealing with is indeed corneal edema. Ask yourself these two questions: Is your vision whitish cloudy (and not dark) and are your eyes pain free? If your answer is “yes” to both of these questions, you are most likely dealing with UAVI from corneal edema. If your corneas appear cloudy/white (as in the photos above), the diagnosis of corneal edema is even more likely. If the answer is “no” to either of the above, you are advised to stop at an aid station for an examination by a medical professional. If you have persistent dark or painful visual impairment and the cause can not be identified at the race, you should leave the race to seek medical attention. If you suspect you have ultramarathon-associated corneal edema, or have had it in the past, 5% hypertonic saline drops may be applied to the affected eye(s). My personal strategy would be to apply them as soon as the visual impairment starts. If you believe you have had UAVI from corneal edema in the past, you may choose to buy protective eyewear and natural tears to use preventively. You may also consider purchasing 5% hypertonic saline drops to take along with you in case vision loss begins to develop. Do You Have Information to Add to the Above? Our research group continues to be interested in eye-examination records and/or eye photos from runners with ultramarathon-associated visual impairment (UAVI), who were examined while they still have vision loss. Have you had any long-term vision or eye issues following an episode of UAVI? If so, we are interested in hearing from you. If you or anyone you know ends up using 5% hypertonic saline drops to treat their UAVI, we would love to know how effective it was. I am in the process of submitting for approval a survey-based study of runners who have used 5% hypertonic saline drops to treat their UAVI. Please contact me at tracybethhoeg@gmail.com if you are interested in participating. Khoadee M & Torres, DR. Corneal Opacity in a Participant of a 161-km Mountain Bike Race at High Altitude. Wilderness Environ Med. 2016; 27: 274 – 276. Anna, sounds like it might have been frozen cornea if you mean 20F. We found UAVI could happen at just about any temperature and did not appear to be significantly correlated with colder temps. My impression is that frozen cornea and UAVI are two distinct problems (though there may be a relation that I am just not aware of). Did anyone take a picture of your eye? That would be a good way to tell. I have had the same problem in 2012 during Western States 100 but I did manage to finish the race … barely few minutes to cut off. I remember vividly that the doctor during the race did not know what was happening and could not provide a quick cure. I also participated in this Vision Loss study after the race. Thank you so much Tracy and your Team for this! I had a similar experience yesterday during the 2018 Frozen Otter 100K. I had LASIK performed on both of my eyes in February 2016. I noticed that my eyes, especially my left, were susceptible to dryness and clouding of vision during long cold winter runs. 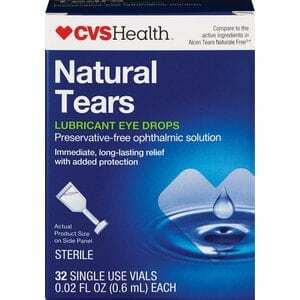 I started keeping single use eye drops (used post surgery) in my car to clear my eyes out. Around 34 miles into my 100K, my vision started blurring. At mile 37, while at an aid station, I applied eye drops, but it made my eyes much worse. By mile 45, I could barely see. I tried splashing warm water in my eyes at that aid station. It helped, but minimally. I went on to mile 55 and dropped. About 9 miles from the finish (it was a 64 mile race). It was dark, in the woods, and my headlamp made for a “high beams in fog” effect where I could not differentiate any details. I was stumbling, falling, and crawling along the ground on my hands and knees trying to stay on the trail. This was a winter race in Wisconsin where temperatures dipped to -10F with the wind chill. While I should have been smart enough to wear goggles or a mask, it just never occurred to me. I had made other plans for safety and comfort, but having trained all winter (and having done a 50K in similar conditions the previous winter with only light drying of my eyes), I overlooked this as a possibility. My eyes are a little dry and scratchy some 12 hours later, but the clouding disappeared after about 4 or 5 hours of sleep. Haven’t read all the reply’s, but could this be an electrolyte issue? Were there any other symptoms of electrolyte depletion? Some might be interested in eyecare — in this case Cloudy Eyes. 4 racers were affected with it at the 2013 Bear 100 and I believe 3 of 4 had to drop. I was a lucky finisher. Maybe this experience will help any other ultra-runners who have been affected and/or want to prevent it. I’ve had a little bit of ‘cloudy eye syndrome’ on some of my cold morning long runs but it was minimal and it cleared up after getting in a warmer place and out of the wind. At the Bear 100 in 2013 it was quite cold for most of the 100 miles. At about mile 30 one of my eyes started getting a little blurry. By mile 45 both eyes were affected. When it got colder and the trail moved in higher/more exposed conditions it got progressively worse. Luckily when it was just me on the trail with a headlamp light pointing in front of me I could make out the key details of the trail. It was slow picking at times but it worked. Wherever snow covered the ground though the light became diffused and just like fog it made for harder discernment of objects. Aid stations were especially bad with car headlights and propane lanterns. I could hardly see there and had to be shown where food was and what it was. So I tried to warm my eyes a little at aid stations for 10 mins or so but got anxious to get back on the trail. By sunrise I was in high elevation, cold conditions, 100% cloud cover and snow-covered ground. I could hardly make out the trail in spots and almost stopped to wait for other runners for me to follow. But I plowed ahead, fortunately found the trail markings and slowly picked my way through the rockier and snow-covered sections. At mile 85 I decided to try a new strategy. I borrowed some semi-wrap-around sunglasses from an aid station worker and then spent 15 mins warming my eyes over a propane heater. Then I hit the trail and shielded my face from any side wind and kept my Buff over my mouth so extra breath moisture would rise up into my eyes. After about an hour my vision improved some. In another hour it was even better. The temperature that day also went up from the day before. By the time I was making the final descent to the finish my eyes were I would guess at 90% clear. So after talking to my retinal surgeon brother, here are some things to consider for next time. 1. Hydration – I was well hydrated and peeing lots. Dr. said that even with good hydration the eyes get fluid secondary to vital organs. So under heavy exertion conditions the eyes can dry out which in cold conditions can result in cloudy eyes. 2. Exposure/Temperature – dry eyes are made worse from wind and low temperature exposure. Keep them shielded to reduce the drying out effect. I will definitely wear clear wraparound glasses on my next ultra. 3. Eye glands – I am occasionally affected with Blepharitis (http://www.webmd.com/eye-health/blepharitis) which comes on every now and again as a result of seasonal allergies. Basically the eyelid oil glands get clogged and don’t allow eye oil to mix with eye moisture to form the film over the eyeball that helps protect it. Dr. recommended to double up on body oils such as flax seed and Omega 3 to ensure enough oil in the body. Then he suggested massaging the eyelids before a race to make sure they are not in a marginal state before the start. 4. Artificial Tears – Dr. suggested that if the eyes begin to appear cloudy to treat with eyedrops immediately to stave off any further drying out. So for me that means a good eye massage and extra oil intake before my next cold ultra and good clear eyeglasses and eyedrops in my ultra kit. After finishing 4 more 100 milers (one each year – either Wasatch 100 or Bear 100) and a few cold-weather marathon-distance races each year, for me the resolution is to wear clear wrap-around glasses. It seems to provide just enough eye protection to keep my eyes from drying out prematurely and also keeps them warmer. When it’s colder I also use a buff to push warm moist air up into the bottom of the glasses. This combo works for me. While I carried eye drops for a few events in 2014 I found I didn’t need the drops. My eyes (especially the left one) do get a little hazy every now and then on cold training runs but never bad enough to dramatically impair my vision like it did at Bear 100 2013. My oldest son just started ophthalmology residency at WashU so this topic is truly near and dear to my heart. I’ll consider packing sodium chloride drops on training runs and report findings. For what it’s worth, at the end of the Mohican Trail 100 in 2010, a young woman, in her 20’s I think, reported blindness after she crossed the finish line. Having earlier given another runner sodium capsules for muscles cramps and agitation at mile 50 of the race, with successful results in a bout 30 minutes, I decided to do the same for her. After about 20 minutes, her blindness resolved. I wondered about a sodium disturbance in ultra runners as a cause of neurological disturbances in at least some of these events. (I work as a neurologist). Has anyone looked at using a supplement such as Lutein rather than using eye drops? Heidi Hehn, good thought but Lutein has been tested for the posterior portion of the eye (“retinal diseases”) but no benefit for the front part (cornea). I tan 23 ultras in 2015, then had a mini stroke and lost 40%of my vision. Also have low blow pressure.